National Geographic Learning brings the world to the classroom and the classroom to life. We want students and their teachers to experience the excitement and joy of learning through our materials. With our English language programs, students learn about their world by experiencing it. Through our partnerships with National Geographic and TED, students develop the language and skills they need to develop their own voice in English, and to be successful global citizens and leaders. We strive to help teachers achieve personal success and be better citizens of the 21st century. 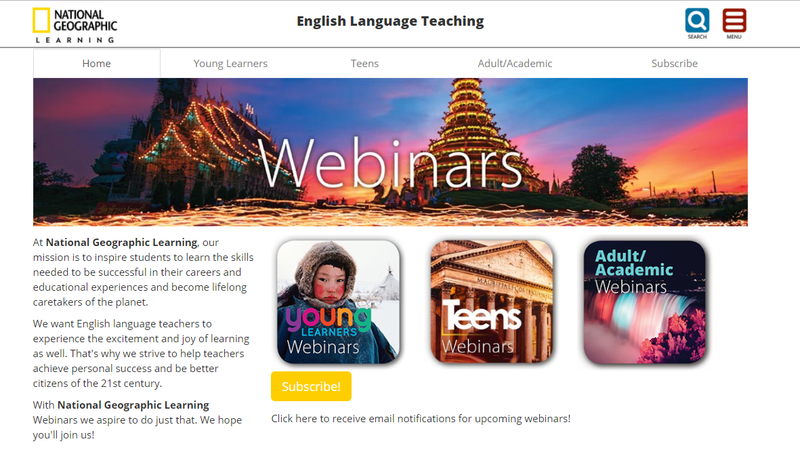 Our webinars feature authors, teacher trainers, National Geographic Explorers, and speakers from the TED stage, focusing on practical tips, interesting topics, and new ideas to help you bring the world to your English language learning classroom. We hope you will join us for a National Geographic Learning webinar. Click here to receive email notifications for upcoming webinars.